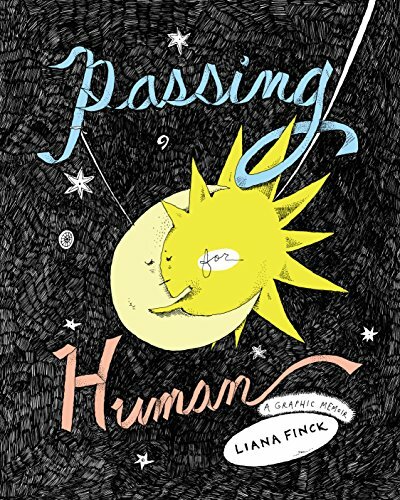 Passing for Human is a compelling weaving of stories about author-illustrator Liana Finck's mother, her father, herself and how each of them has difficulties figuring out themselves, figuring out who they are as people, as humans. The words are brilliant, but the art is oddly unsatisfying, which is surprising since so much of this graphic memoir is about drawing and the creative process. Finck writes about wishing she'd kept drawing as a child instead of stopping, she writes about how drawing itself makes one draw better, so one expects the drawings to solidify, to become more adept over the course of the pages. Sadly, that doesn't happen. The pacing, the visual narrative are all strong despite the weakness of the actual line, which shows how powerful the work is and how much more powerful it could have been in the hands of someone like, say, David Small (author-illustrator of the graphic memoir Stitches). Finck has written a fascinatingly deep look into our shadow selves, into what makes us complete, what defines us. Her sense of being an outsider, of not quite fitting in could be read as an adult version of Florida Frenz' How to Be Human, a teenager's journal describing her experience as an autistic child, figuring out to intepret human behavior and fit in. Where Frenz describes things directly, giving a sense of being inside an autistic person's perceptions, Finck takes a more oblique path, using biblical stories, parables, and shadow selves to evoke metaphors for her struggle to be seen as human. The metaphor of the shadow self, part soul, part gut instinct, part core self, is beautifully evoked in each person's story. The pages with the shadows are also some of the best rendered. Still, there is an unsettling lack of definition to all the faces in the book. Perhaps that's intentional since selfhood—and the difficulty of grasping and holding onto it—is a central theme to the story, but the inability to read emotion or expression in the faces also places a barrier between the reader and the people we read about. In fact, the reader feels the same “outsider” experience, the same forced distance that the narrator expresses in her relationship with the world. Perhaps the lack of careful drawing is intentional, a forced mirroring of the narrator's view. There is a wide range in drawing quality in graphic memoirs, from lightly cartoony to heavier superhero style, and some readers may be fine with the scribbly minimalism of Passing for Human. But it is also a missed opportunity for visual richness, to show the development of drawing as the story develops, as the narrator discovers and holds onto her own shadow, her own sense of self.